This post is not the startling and mind-blowing research project that we saw from the Canadian shooting, the Dallas ebola ground zero patient, nor many of the Project August predictions. It’s probably more akin to the Heidi Klum double-top linguistics fan fare we got that predicted her magnificent Halloween outfit a month ago. This post is not nearly as entertaining, but I’m not writing it because of any shock value….I’m writing because of the lessons that can be imparted by this ever-so strange story that was headlined over at Drudge yesterday. 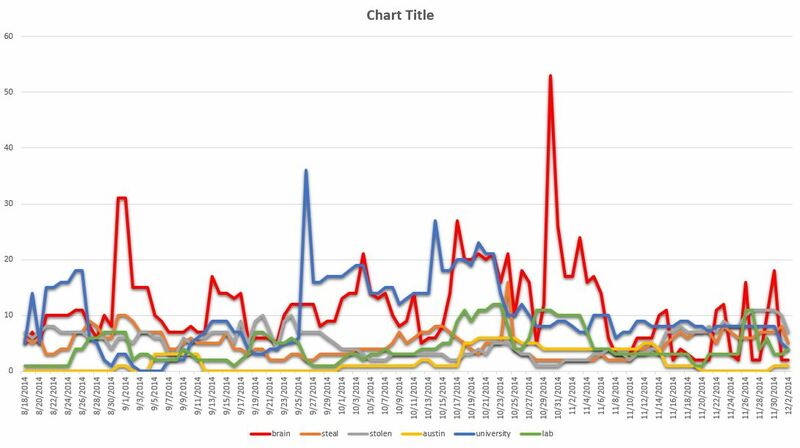 A HUGE spike in “Brain” on the 30th of October was overshadowed by a whole lot of impressive words, including the double top pattern of Heidi Klum’s Butterfly outfit that would end up overtaking the media mindstream within 24 hours of that run. I’m not particularly fond of this latest linguistics, but I have to admit here, that ALIENS have shown up twice with BRAIN. Could it be that illegal aliens were the ones at fault for this story I’m about to share? I was intrigued because I wanted to see if this was a story that should have been caught, and while the words and stats might be sufficient and available to have predicted this event, I’m more worried about learning how all this works, or at least garnering some more statistical mapping of our collective precognition. 33 Days. This is how long THIS particular story followed the biggest spike in Brain back on October 30th. To be sure, is there really any assurance that the word Brain spiked on October 30th for this specific story? It’s hard to tell with any real certainty, but the linguistics phrases do seem to lean toward this story. For example, on the biggest spike on the 30th, it said, “Plenty Warning.” Well, does that help indicate the timing on the word Brain? In other words, does it say, “Hey, this word is preceded with plenty of warning, so don’t expect the manifestation in the typical timeframe? The next example was about a month later when it quietly popped up again, but this time it actually gave immaculate clues as to where this news was going to originate. “Drawing LAB UNVERSE thank epic…” The 100 brains were taken from a LAB at a UNIVERSity (wow, nice little metaphor/pun sort of connection there). Notice the escalating triple top pattern just before the news came out (note the red line, which is the number of daily hits on the word Brain). That triple top manifested about a month after the record spike in October, and the DreamBot caught two of those three mini-spikes. So, when looking at the chart, the blue line is University and the red line is Brain. Lab is the green line and you can barely make out an even smaller spike with Lab on November 26th. The gray line represents “Stolen,” which also makes a mini-climb just prior to the news. 1. Take note of repeating words in sequential and increasing fashion, even if they are considered low-surging words. The surge scores during the triple top were scant at best, so the best indicator was simply seeing the word reappearing on the surge list. 2. In absence of harmonics or resonance in the dream words, simply look at the linguistics phrases to at least get a flavor or slight context for the coming headline. In fact, since we know mainstream (and even alternative) media loves to hide and/or fabricate information, linguistics has been absolutely amazing at digging up the underlying truth. Again, I’m wondering whether illegal or space-type aliens are at all implicated in this brain theft. Unfortunately, I’m not sure whether we’ll ever really know. 3. Very important: Notice how we have the same basic pattern as so many previous linguistics. That is, you get a huge spike in the word and then it falls off. Then, just like Dallas and even the Canadian shootings, you get a slight rise right before the event. Here’s something else…this phenomenon I just described is only applicable for NON-RED-ALERT words. Red Alert words have a habit of manifesting within a couple of hours to a couple of days. Non-Red Alert words take much longer, and that is pretty much a 100% hard and fast rule at this point. 4. dsTriple Top = UNUSUAL. Go back to the chart and look at the red line (Brain). On the far right, notice the 3 mini spikes happening almost every other day, and notice how the peaks increase slightly. There are some words in our inventory that cycle repeatedly. Those are very hard to judge for precognition. But a word like Brain should be straightforward for two reasons: 1) a huge spike followed by a dropoff, 2) a slight rise about a month or so later. Throw in the Triple Top and now you’ve got a real winner. One might ask about University not making the same sort of overall path in the days leading up to the brain theft. That is admittedly strange, but even more strange is that “Universe” covers the gap very nicely, with its own double top completed on November 27th (note: Universe is not charted in this graph). Why did the collective choose Universe instead of University? Ah, there’s no use asking unanswerable questions. Bottom line: double-top and triple-top patterns matter, and so do metaphors and puns. Lucky Agents – This meme was exhausting!